Last night, at the school auction an unknown jazz band played on the balcony, near the front door. It was a perfect evening outside, warm, with a slight breeze. The women wore high-heeled sandals and sleeveless shirts. They sound incredible, everyone entering the auction agreed. Who are they? “The Majestics,” I replied, propped up by the front door. I nodded my head in time to the music. Everyone stopped to listen awhile before moving into the building. I didn’t leave. I stood there, transfixed, with tears in my eyes, for the entire 1 hour and 45 minute set, as The Majestics played against the setting sun. This was more than a mother’s pride in her son. I think my son is brilliant, talented, handsome and fascinating every day, but last night was a glimpse into the future. I could see, in this one performance, the man that my son is to become. Raising him over the last 17 years, I have provided him with opportunities and experiences that have shaped who he is today. 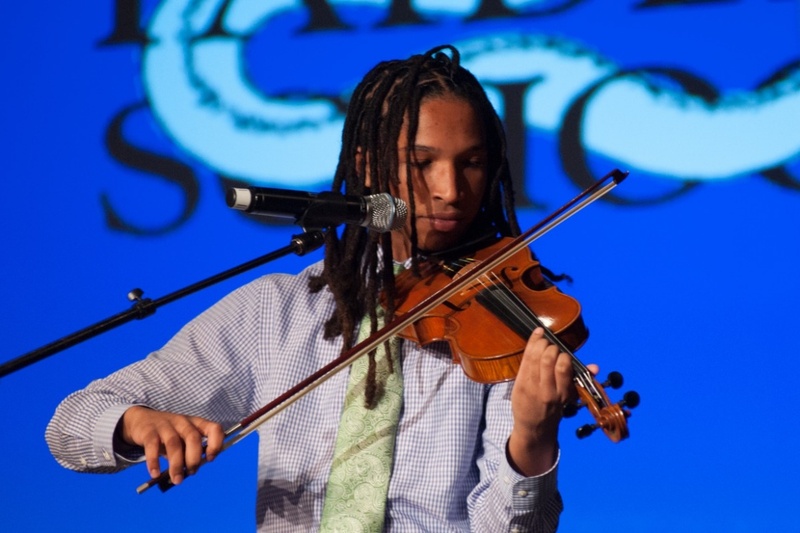 Driving him to (and paying for) private violin lessons since the age of four gave him the opportunity and finding ways for him to perform provided the experience. But the way he played last night was more than music lessons and even raw talent. There was passion and joy and love in that boy, love for music and love for life. It was the very essence of who he is. I want you to know that I see you son. That video is fantastic. Your son is amazing! He seemed so entrenched in the music. So dedicated and happy. My daughter just started playing the flute six months ago and I love hearing her practice. Hats off to you for exposing him to wonderful things.